This is a different kind of a question bank. You can search questions by means of their tags or codes. 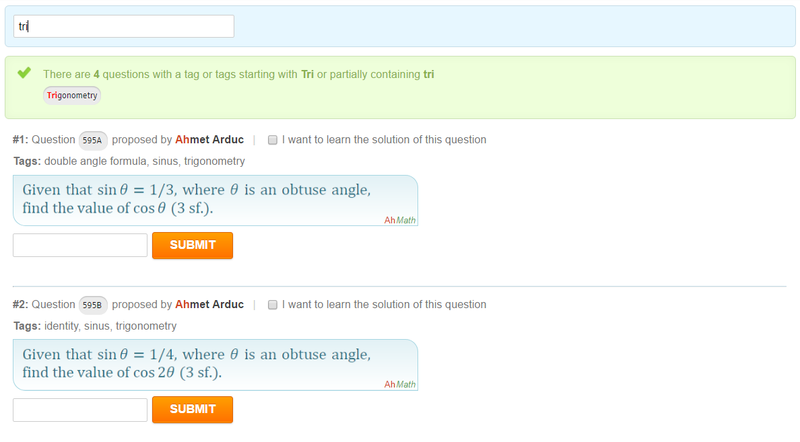 This way you can find questions from different chapters all related with a common tag. Each time the system will show you at most 6 of the questions randomly. If you have some more unsolved questions, refresh the search box to get new questions. There are 216 questions in our Question Bank. Please send your general comments about the question bank to info@ahmath.com. Below is a screenshot about what you'll see when you log in.